Leadership: Dr. Alexandra Barton Otto convenes a midday huddle with hygienist Jessica Tamez (left) and assistant Kristen Lassetter. Though Drs. Gabriel Holdwick and Alexandra Barton Otto work in two different practice settings, they share similar challenges when it comes to being a leader in their dental offices. 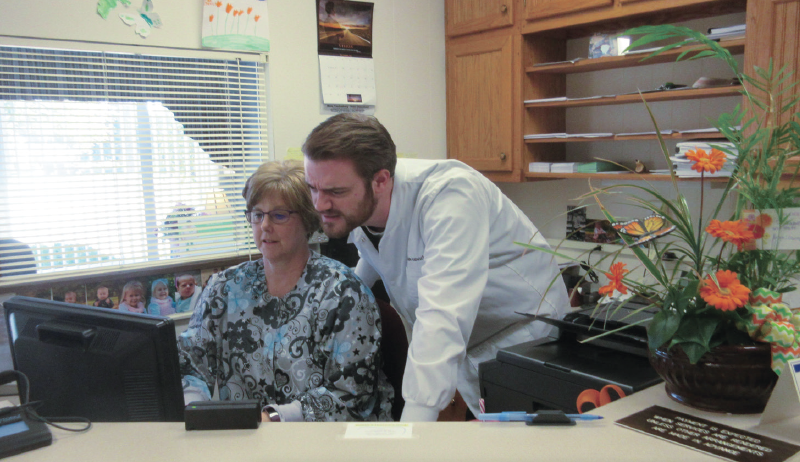 “I am not sure you are ever really ready to take on the mantle of leadership,” said Dr. Holdwick, a general dentist with one hygienist, one assistant and a receptionist in his Harbor Beach, Michigan, practice in a town of 1,700. “There are just things you can only learn from doing it. Situations arise, and I don’t always have the answer. Dr. Otto works at fi ve different offi ces alongside more than 30 assistants, six hygienists and dozens of other auxiliary staff. Being dependably constant is one thing she has learned since she graduated from the Virginia Commonwealth University School of Dentistry in 2013. To Dr. Otto, encouraging reinforcement is key to being an effectual leader. As for Dr. Holdwick — a graduate of the University of Detroit-Mercy School of Dentistry in 2014 — being a leader in the office should translate to being active in the community. “My patients expect me to lead while I have an instrument in my hand, but they also look to me for guidance on matters related to treatment planning, finances and the balancing act of dovetailing dental care seamlessly into lives that are often filled with other pressures. Both espouse the view that being a servant leader and collaborative are goals to aspire to, whether you are a team member or lead your own practice. And as new dentists, they realize that effective management skills are gained throughout a long career. To learn more on how to manage a dental team, “The ADA Practical Guide to Leading and Managing the Dental Team” is available. Readers can save 15 percent on this book and all ADA Catalog products with promo code 17155 until Dec. 15. To order, visit ADAcatalog.org or call 1-800-947-4746. The ADA Center for Professional Success features resources on leadership and management of the dental team, including a podcast on being a great boss and a guide to running effective team meetings. The resources are available at Success.ADA.org.